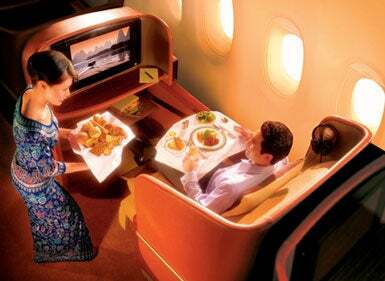 Singapore Airlines is installing iPod docks and 15.4-inch widescreen LCDs in their all-Business Class Airbus A340-500 flights between NY/LA and Singapore, ensuring that we're going to be flying with them if we ever have to travel to that part of the world. Each business customer can dock their iPhone or iPod and watch their own movies on the included noise-canceling headphones—which will be interrupting when the captain wants tell you to look off to your left so you can see a drunken Superman mooning your plane. Flights from Newark with this will start May 15 (today), and August for the LA ones. Maybe now business passengers won't engage in business time whilst in the air.